Last week, we lost one of the Grand Dames of the fiber arts world. Yvonne Porcella was a prolific artist, an inspiring teacher and the instigator of life-changing moments for many. She started SAQA, the Studio Art Quilt Association, which has helped legitimize the creation and selling of art quilts as a viable business. 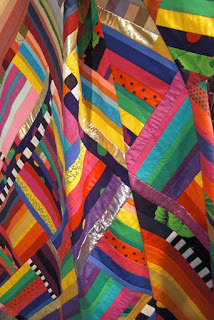 Yvonne loved and was skilled in a huge range of fiber and surface design techniques. I will never see an artwork with strips and bits of black and white checkerboards (usually paired with bright colors) without thinking of Yvonne. That became her signature look. But she just as easily achieved a sense of delicacy with hand painted pastel silks, composed into breathtakingly lovely floral compositions. Her fashions were innovative and stitched with couture-level impeccability. Yvonne was the essence of joie de vivre. She was open-hearted, encouraging, full of enthusiasm and ready for any bit of fun. Those who considered her to be both a friend and a mentor are legion. Yvonne now rides her own dragons in the sky, but when we pull out our fabrics, paints, and dyes, she will always be with us.